"Tuig" has several meanings. It is most commonly used to describe a group of scumbags. It can also be used as an adjective (see Examples). In the seventies, the expression "langharig werkschuw tuig" ("long-haired workshy riff-raff") was used frequently to describe everyone who wasn't willing to work or had a different interpretation of working (musicians, etc.). Nowadays, every Dutch person will still understand what you mean. -" Mijn buurvrouw hoopt dat het kraakverbod wordt aangenomen. Ze vindt alle krakers werkschuw tuig." -"Dat tuig heeft in alle auto's in mijn straat ingebroken." – "Hij heeft dat arme omaatje zomaar in haar gezicht geslagen. Hij is tuig." – "Tuig van de richel": scum of the earth. Lit. : scum of the (l)edge. – "Hooligans zijn echt tuig van de richel". The picture belongs to a Hyves-group with the name "Tuig van de richel". Related verbs are "optuigen" and "aftuigen". Both verbs were originally (and still are) used in the sense of "to harness" and "to unharness" a horse. Although the verb "aftuigen" is still used in this sense, nowadays, its most common use is "to beat up someone". "Optuigen" can also be used in the meaning "to decorate". – "Ik ga de kerstboom optuigen, haal jij de ballen?" – "Dat tuig heeft gisteren mijn buurman afgetuigd." The second meaning of "tuig" is "harness" that you put on your horse (see picture). -" Ik heb een nieuw tuig voor mijn paard gekocht." -" Een blindengeleidehonde heeft vaak ook een tuigje om zodat zijn baas zijn bewegingen kan volgen." – Optuigen: to harness, to decorate [verb] [tuigde op, opgetuigd]. – Aftuigen: to unharness, to beat up [verb] [tuigde af, afgetuigd]. – Werktuig: equipment [noun] [het werktuig, de werktuigen]. 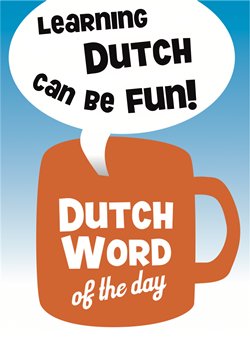 This entry was posted in Dutch word of the day, DWOTD 1.0, Vocabulary Intermediate by Laura. Bookmark the permalink. As far as I know, the diminutive of ‘oma’ should be ‘omaatje’. I do agree that writing oma’tje next to oma’s makes more sense, but that’s not the rule. I changed the omaatje – my mistake. The rules are a bit odd in this respect: all vowels double in diminutives except for the y (baby becomes baby’tje) and the i (taxi becomes taxietje). In the first example you translate werkschuw (literally, I guess) as “workshy”. In my New Oxford American Dictionary workshy is hyphenated: “work-shy.” So, we understand from your example that the woman doesn’t like squatters because they don’t work. It’s all perspective, I guess, but there are other appropriate synonyms: “lazy” or “idle.” What are Dutch synonyms for “werkschuw”? TUIG is also a description for parts of a sailing boat. Mast, sails, stays, boom, sheet, etc. Further typing is done with TorenTUIG, GaffelTUIG and many more description of different forms of rigging. I’m interested to know what the connection might be to “vliegtuig”; flying…harness? scumbag? rigging? None of these sounds very likely. Also, thanks so much for this brilliant site. I really look forward to getting my word every day. @Jay – Hi Jay, I think that in this example Laura deliberately refers to the expression from the 70s that she mentioned in the introduction. I can’t think of any direct synonyms for “werkschuw”. The more general “lazy” however translates as “lui” (which is a very common word). A good expression is “luie donder”, used for deliberately lazy persons. @John – Hey John, “tuig” can also mean “equipment” or “material” and I think it is used in that meaning in words such as “vliegtuig” (“aircraft”), “oorlogstuig” (“armaments”) and “werktuig” (“machine/tool”).